November 3, 2014 (Seattle, WA) – The U.S. Department of Agriculture (USDA) has determined that Woodland Park Zoo is in violation of an Animal Welfare Act (AWA) provision regulating the housing of elephants outdoors. The inspection report notes that Zoo staff acknowledged that elephants are routinely locked outside without access to shelter during rain. The report also calls attention to the inadequate and dysfunctional configuration of the Zoo’s elephant exhibit, stating that “only one elephant at a time may be offered access to both the barn and the outdoor enclosure.” As a result, one elephant is locked in a cage in the barn in solitary confinement and one elephant is locked outside—both up to 17 hours a day. According to the USDA report, Zoo staff stated that they intend to build a rain shelter in a year—two years after the Zoo’s own self-appointed Task Force recommended minimal improvements to the Zoo’s elephant exhibit, which included the addition of rain/wind shelters to protect the elephants from our unsuitable climate. It is egregious and inconceivable that the Zoo has failed to take even the most minimal precaution to protect elephants from the obvious challenge of captivity in Seattle’s climate: rain. This violation demonstrates that the Zoo is ill-equipped and lacks commitment to housing elephants in a manner that meets the most basic standards of welfare. Woodland Park Zoo’s admission yesterday that Watoto, an elephant who died on August 22, 2014 after she was found down in the morning, confirmed in part what we already knew: Watoto died from chronic health issues caused by zoo confinement, most notably debilitating arthritis. But the Zoo raised more questions than it answered and continues to ignore two critical questions: How long was Watoto down and who, if anyone, monitored the elephant exhibit the night and morning of Watoto’s death? The Zoo’s medical records showed steady deterioration in Watoto’s arthritic and lame condition. The Zoo’s records state “chronic reduced range of motion” and “increased lameness.” The lameness had gotten so extreme that she was taken off display for a time prior to July 21st, 2014. Arthritis and lameness in elephants confined in zoos is directly related to their environment and among the leading causes of premature death. Watoto was forced to stand on hard substrates during prolonged lock up in the barn and on unyielding compacted ground outdoors. Records obtained by Friends of Woodland Park Zoo Elephants confirm that nighttime security did not visit the elephant exhibit the evening and morning of August 21 and 22. Security staff made rounds which included patrols of the parking lots, gates, fences, the carousel, the rose garden, and furnace with no visit to the elephant exhibit. This means that Watoto could have been down for at least eight hours before keepers discovered her the morning of the 22nd. The Zoo acknowledged that it can be life-threatening for an elephant to be lying down for an extended period of time. 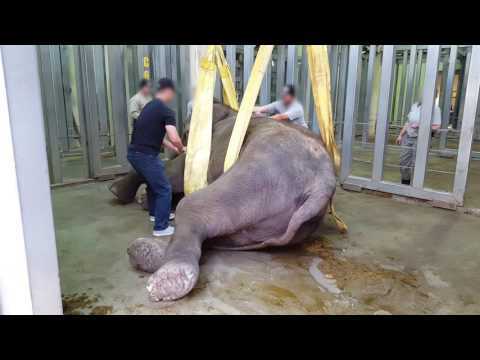 Why did the Zoo fail to provide overnight monitoring to an elephant known to suffer from chronic lameness, which put her at risk of falling down or increased her inability to rise on her own? Despite Watoto’s decline and the grave consequences associated with a fall, Woodland Park Zoo’s Elephant Management Protocol does not include any plan to manage emergencies involving its elephants; even emergencies as common in the zoo industry as elephant falls. Attempts to raise Watoto the morning of the 22nd with cloth straps and machinery were unsuccessful. While the Zoo took “several hourly blood draws,” it never called the fire department to attempt to raise her. Elephants in similar deadly predicaments in zoos have successfully been raised with fire department equipment, as was the case with Maggie in Alaska, who went down twice. Maggie is now thriving at the PAWS sanctuary in California. “If the zoo had adequate monitoring in place or called in the fire department to raise Watoto, she might be alive today” says Alyne Fortgang, Co-founder of Friends of Woodland Park Zoo Elephants. Friends of Woodland Park Zoo urges Mayor Murray, the Seattle City Council and the Woodland Park Zoological Society to immediately retire the two surviving elephants, Chai and Bamboo to a sanctuary. At a sanctuary they can experience what was denied to Watoto: the opportunity to heal from the physical and psychological damage caused by captivity and the chance to live a long life in a warm climate on vast acreage.